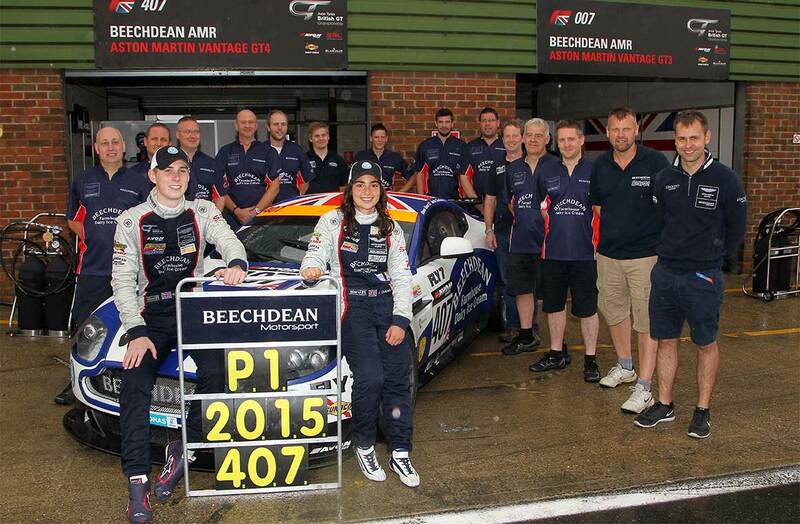 24 August 2015, Gaydon - Aston Martin Racing partner team Beechdean AMR has retained the British GT Championship GT4 title at the penultimate round of the nine-race series with Aston Martin Evolution Academy drivers Ross Gunn (GB) and Jamie Chadwick (GB), in a weekend that also saw success for the marque in the leading GT3 class. As well as becoming the first female to win a British GT Championship title, Chadwick, aged 17 years and 95 days, has become the youngest competitor to take the GT4 title following the team’s results at Snetterton yesterday. Chadwick and team-mate Gunn are both part of Aston Martin’s inaugural Evolution Academy, a programme for GT racing’s top up-coming talent that offers training and advice from the factory team based at Prodrive in Banbury as well as support from the prestigious road car marque. In addition to clinching the GT4 title, Beechdean AMR’s GT3 team of Andrew Howard (GB) and Jonny Adam (GB) won the second one-hour race yesterday to close the gap to the overall championship leaders to just two points going into the final round at Donington in three weeks. In fact, of the six GT3 podium spots up for grabs today, Aston Martin V12 Vantage GT3s took five of them, locking out all three steps in race one and taking the win and third place in race two. Team Principal John Gaw said: “What a weekend of celebration for Aston Martin Racing customer teams! Obviously, it’s fantastic that Jamie and Ross have won the GT4 Championship with a round to go. They have both seriously impressed this year and are both very deserving. After such success in GT4, I’m sure Beechdean AMR will be determined to ‘do the double’ and take the GT3 title. The final round of the British GT Championship takes place on 12/13 September at Donington Park.